John F. Kelly, White House chief of staff, gave a press conference to address the controversy over Trump’s remarks to a grieving mother of a soldier killed in action. 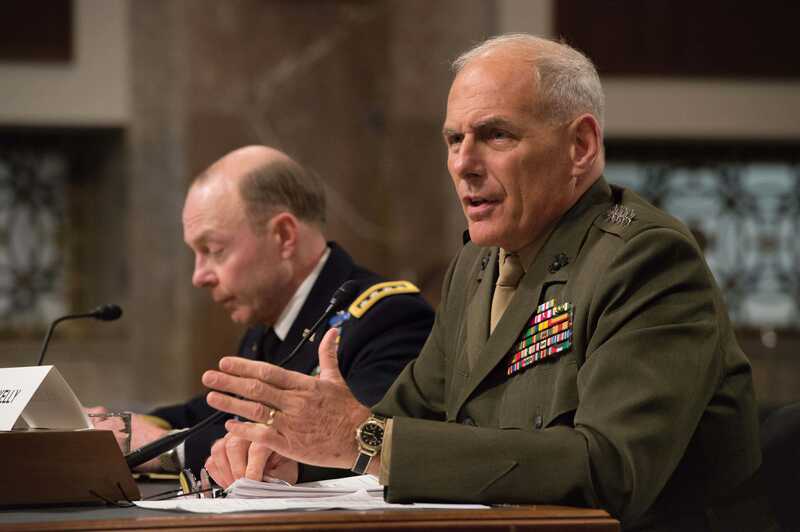 Trump was reported to have been insensitive in saying that the kid “knew what he was getting into.” That remark sounds clumsy, but in content, Kelly said, it underscores the absolute heroism of anyone who signs up with a willingness to give your life for the country. The “serve or die” rule remains in place today, not only in Russia, China, and North Korea but also in the U.S. The powerful speech, which spoke of his own son who was killed in the line of duty, left the critics silent. And so yet another Trump controversy ends the same way as so many others. He offers a weird formulation. The rat pack of journalists on the hunt for any misstep feign outrage. The picture of what actually happened emerges more clearly, and Trump comes out in the end as the misunderstood champion of true American values. I do wonder, however, if it is tremendously obvious to those who sign up for a tour of duty that this is indeed what they have signed up for. I’ve talked to countless service men and women over the years and hear a very different outlook. Recruitment marketing doesn’t talk about killing and being killed. It speaks of living a big and adventurous life, being all that you can be, getting a great education, gaining outstanding skills, being part of something larger than your own life. What about the common assumption that the real reason people sign up is to realize a boost in socioeconomic status? Studies have examined demographic factors that led people to sign up. Here is one conclusion. “Among race, socioeconomic status, and immigration status, socioeconomic status is the only significant predictor of having ever served in the military.” That is to say, the common assumption is absolutely true. They are looking for a better life–and presumably hope not to die in the course of it. But the military is not a regular job. You can quit normal jobs if you don’t like your boss, your assignment, your pay, or your working conditions. For the military, it is completely different. You cannot walk away. The penalty for doing so is execution, though this option is not usual in the United States (long jail terms are preferred). Still, it is threatened. It’s been this way since the ancient world. Despite every other form of emancipation that has taken place since the 1700s and following, the death penalty for desertion (quitting) has not changed. It was used in the War of 1812 in which 12% of the soldiers tried to quit. In the Mexican-American war, the US hung 30 soldiers who tried to leave their posts. Both the Northern and Southern Armies in the Civil War used conscription and the death penalty for deserting. In World War I, Britain shot 304 deserters and France killed 600. In World War II, Nazi Germany killed 15,000. In the U.S., despite tens of thousands of desertions in wars in the 20th century, the last person to be executed outright was 1944. The “serve or die” rule remains in place today, not only in Russia, China, and North Korea but also in the U.S.
And how long is the statute of limitations? There is none. The military advertises itself as an alternative employment path. But it is anything but a normal job. The US has a “voluntary” military but your choice ends the moment you sign. From that point on, you might as well be a conscript. If a private business tried this, it would be a national scandal. The managers would be prosecuted and jailed for human trafficking and enslavement. All people of conscience would be sickened. New laws would be passed to prevent this from happening again. Think about that the next time you sit next to enlisted personnel on an airport. If you detect weariness, anxiety, or even demoralization, consider that it is not because they do not want to serve their country. They do. What destroys the human spirit is the reality that your right to choose has been taken away, should conditions turn out differently than you expect. They want to serve the cause of freedom, but they are themselves not free. The penalty for desertion presents a problem for the claim that all these people know what they are getting into. Here is a case that happened just this week. A man named Jeffrey Lantz was arrested in Florida. He is 64 years old, married with kids. In 1998, he had founded and ran a successful construction company. But some investigation discovered that his real name is Jeffrey Michels. He signed up for the Air Force, was sent to North Dakota to guard some missile silos, and one day in 1977, he didn’t show up for work. Forty years later, he was arrested from his home and now languishes in military prison. The penalty for desertion presents a problem for the claim that all these people know what they are getting into. At best they know when they first sign up. But they are not allowed to change their minds later. No matter how bad it gets, they must follow through, risking death by staying on the job or facing death at the hands of their bosses should they decide to walk away. As I read about the story, I thought of the 40 years in which he tried to live a normal life, all the while knowing that his freedom could end at any moment. One knock at the door and he would be finished. Nothing else he has done in his life–good husband, father, worker–matters, all because on that one fateful day in 1977, in the wake of mass desertions during the Vietnam War, he didn’t show up. Post-signing conscription doesn’t work well either. I’m in the middle of rewatching Mad Men yet again. The entire story of Donald Draper is about his act of “cowardice” in the Korean War. He switched tags with a dead man, so that his old self would die and he could reinvent himself and go home. Presumably, this is a horrible crime. But when it is revealed to his bosses at the advertising agency, the CEO completely dismisses it. Who cares? What matters is your value to the world right now. The military does not think this way. You do your tour. You obey orders. If you do all you are supposed to do, you are free to go. If you do not, you will never get your life back. One reason that the draft was ended in the US was that it became obvious that soldiers who volunteer are better at doing what they do than those who are conscripted. What if we took this even further to observe that post-signing conscription doesn’t work well either? Even the military itself has discovered the awesome utility of using private military contractors for a range of purposes in Iraq and Afghanistan. With fewer enlisted personnel than in 20 years, and too many wars going on in too many places, the American empire has come to depend on these private services. But notice something here. The employees of companies like Academi are real employees. If they don’t like their jobs, they can go. There is no such thing as desertion. Maybe that is one reason that such services have proven so effective? It might be true that anyone who signs up to serve in the military knows the dangers. The penalty shouldn’t be incarceration or death if they change their minds. This article would have been much better if you had not praised the renamed Blackwater at the end. Private contractors in a statist society only lend efficiency to evil.